Roar Map~ Power lies with those who can control the storm. Welcome to Catlira. 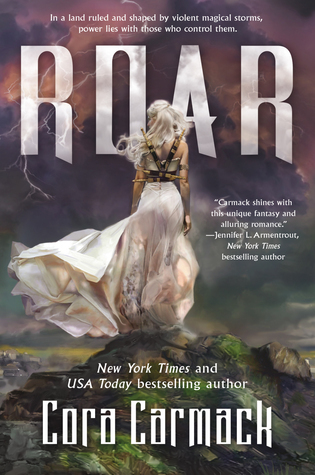 Get to know the world of Roar by Cora Carmack with this downloadable map. Print it our and color it in. When I started this one I wasn't too sure about it. It didn't really feel like a young adult fantasy book and was leaning more towards how adult fantasy feels to me. But shortly after reading a few chapters I was engrossed in the world and the story and I couldn't put it down. I loved Aurora, Rora, Roar and how she never gave up no matter what was going on. She knew her mind and wasn't scared to do what needed to be done. The side characters were fabulous and everyone had something that needed to be done so they all fit very well within the story. The world building was fantastic! I loved how original this story was as we don't get many things that are new in young adult these days. But the entire aspect of the storms and magic in this world was something new! The story flows very well and the pace was wonderful. It did get a little slow in the middleish part but it wasn't slow enough to really kill the story. The ending of this one will have you screaming THATS IT?!?!?!?! and the twist and POVs were wonderful. This is one where although you are mainly in the POV of Roar you also have moving POVs throughout the book. They are all done very well and you will always know where you are. I never wondered who's POV I was in which was great. I love series but I do believe that each one even if it ends on a cliffhanger should feel like a full completed book and this one just fell a little far from that. But even with that, it was still a 5-star book. The rest of the story etc was wonderful and this was more personal opinion than it really ruined the experience of the story. Storms, Stones, and some pretty steamy parts! Something new for the young adult crowd! Cliffhanger!! Aurora, Or Rora is the main character of this book. People say it was a romance but I think the romance was around the middle to the end. This felt like an adult fantasy. Most characters have either big or small conflicts, and there was a point where some characters get lost in thought. Even though this book didnt appeal to me, as I read it, I changed my mind towards the end. I like that Aurora is a strong female character. I didn't like the cliffhanger at the end. Also, I wish there was more information about the storms. Maybe even a book about their kind an species. To me, I didn't get enough information about them. Thanks to Jean Book Nerd for the extra copy of this one!